Last Thursday Leigh Sales “grilled” Prime Minister Malcolm Turnbull over proposed changes to Australia’s citizenship laws. Changes include a more stringent English language test, proof of integration into Australian society, and a four-year waiting period for permanent residents to apply for citizenship. Sales considered these proposed changes to be an aberration of Australian liberalism and out of step with Turnbull’s own political philosophy. LEIGH SALES: Before you became Prime Minister, your image was that your values put you in the small ‘l’ liberal tradition of Alfred Deakin and Malcolm Fraser. Can you today name one policy position that you hold that aligns with that tradition rather than with the conservative wing of your party? Ironically, the policy that Turnbull could name is the very policy under discussion. The tightening of citizenship laws, especially using racialised notions of cultural values, English-proficiency, and religious belief is deeply entwined with the legacy of Deakin. Turnbull is careful to avoid explicit appeals to race in the ethno-biological sense. However, his emphasis on the “unique” Australian values – “freedom, equality of men and women, mutual respect, the rule of law, democracy, a fair go” – serve as markers, shibboleths and “tone of thought” for indicating who is “in” and who is “out”. The subtly of these dynamics was demonstrated when asked about who can integrate into Australian society. Turnbull gives a quick – “of course they are” – in response to Sales’ question “Are Jews who celebrate Hanukkah integrated into Australian cultures and values?” In contrast, he gives a bumbling non-response to the question about whether a woman who wears a headscarf is also integrated. MALCOLM TURNBULL: Well, people are free to wear whatever item of clothing they like. I mean, bear in mind, I say again and again, whenever I talk about Australian citizenship and Australian values, I say that the foundation of our success, our extraordinary success, is mutual respect. And that means… It’s a two-way thing. You respect others in their diversity and they respect you. It’s also about respecting the equal rights of men and women. And that is vitally important. This and other tortured debates about the right and wrong way of applying Australia values of a “fair go” and “mutual respect” reveals the implicit way some forms of life are accepted and others are rejected. Turnbull’s proposed changes to the citizenship laws do not stray far from those who went before him. From Deakin to Abbott, Australian liberalism (spelled with a small or large ‘l’) has tied itself in knots to restrict the entry and freedom of racialised others. Despite his progressive shtick and love of public transport, Turnbull is no different. ‘…man is an invention of recent date. And one perhaps nearing its end’ (Foucault 1973, 387). Foucault goes on to conclude The Order of Things with the evocative image of man being erased ‘like a face drawn in the sand at the edge of the sea’. Foucault’s anti-humanism, especially as expressed in these lines, has long been considered to preclude the possibility of human rights entering his thought. In a 1981 interview questioned on this very point – ‘Do you reject any engagement in the name of human rights on the grounds of the death of man?’ and later ‘I am wondering if it is possible to reconcile the movement in favour of human rights and what you have said against the humanist subject’ (Foucault 2014, 264-65). It is these questions of engagement and reconciliation between Foucault and rights that Ben Golder explores in Foucault and the Politics of Rights (Stanford University Press, 2015). Golder is not the first to address Foucault’s discussion of rights in his late interviews and lectures. However, he is one the first to do so without characterising Foucault as betraying his earlier critiques of the subject and sovereign models of power in order to embrace liberalism. Rather, Golder exegetes Foucault’s lectures and late interviews as a continuation of his previous work. Foucault’s rejection of the universal human subject (The Order of Things) and critique of sovereign model of power (Discipline and Punish and The Will to Knowledge) are examined alongside what Golder calls ‘Foucault’s curious deployment of rights’. For example, Foucault states, ‘we should be looking for a new right that is both anti-disciplinary and emancipated from the principle of sovereignty’ (Society Must Be Defended) and claims to the ‘rights of the governed’…‘a new right – that of private individuals to effectively intervene’ (Confronting Governments: Human Rights). Golder examines these remarks on rights as tactical and useful instruments for political struggle. Drawing on the Security, Territory, Population lectures, Golder argues that Foucault’s deployment of rights in the late-70s and early-80s is akin to the counter-conduct tactics used in the lead-up to the Reformation. Foucault argues that in response to pastoral practices that sought to govern or conduct the life of the church, a series of tactics were developed to counter this conduct. John Wycliffe, Jan Hus and associated Christian communities re-purposed the governmental instruments used by ecclesial authorities (e.g. scripture or community or ascetic practices) and opened the possibility for insurrection and resistance. tactical and strategic possibilities of rights as political instruments (Golder 2015, 23). In conceiving rights in this manner, Golder is able to take Foucault’s late discussions of rights seriously without suggesting that there was a serious break with his earlier work. While Foucault may critique the anthropological and political foundations of rights, this does not preclude the possibility of making use of rights discourses in specific political contests. Golder’s formulation of rights as critical counter-conduct can be read as part of a wider literature seeking to move away from tired debates over whether Foucauldian analyses of socio-political struggles are self-defeating with little room for meaningful action. Like Amy Allen (The Politics of Our Selves, 2008) and Colin Koopman (Genealogy as Critique, 2013), Golder appeals to the idea of ‘critique’ and Foucault’s relation to Kant to argue that there is an affirmative (if not normative) dimension to Foucault’s project. In his essay discussing Kant’s “Answering the Question: What Is Enlightenment?” Foucault puts forward a notion of critique that is genealogical rather than transcendental. While the Kantian critical project sought universal structures of knowledge, Foucauldian critique is opened up via “historical investigation into the events that have led us to constitute ourselves and to recognize ourselves as subject of what we are doing, thinking, saying” (Foucault 2000, 315). Through his own historical or genealogical investigations into punishment, sexuality or subject-formation, Foucault opened up space for critical questioning of ourselves. Importantly, this ‘critical ontology of ourselves’ is not a new body of knowledge or information, but a critical ethos or attitude that is performed and lived. Golder rightly identifies the way narratives of human rights and associated events have formed a prominent story that we tell ourselves and in which we recognise ourselves as subjects. Drawing Samuel Moyn’s historical analyses of human rights, Golder suggests a genealogical critique can reveal the contingent grounds of rights and expose areas vulnerability to contestation and reform. In this sense, Golder’s use of critique is more than a negative project. It is in the process of the critique of rights that he makes the affirmative move of re-deploying rights a critical counter-conduct. Like the proto-Reformers who used ecclesia tools to create openings to resist the pastorate, Golder suggest that rights, as a practice of critical counter-conduct can resist governmental strategies that subjugate and govern too much. In putting forward this argument Golder stresses the ambivalent nature of rights, which corresponds to the reversibility of power relations described by Foucault in The Will to Knowledge. That is, the use of rights as a political instrument or tool is always vulnerable to co-option by the governmental strategy – a liberatory moment can be transformed into another instance containment and constriction. To demonstrate the ambivalence Golder examines Foucault’s discussion of gay rights, abolition of the death penalty, and right to suicide. While on the one hand, Foucault was concerned that a dependence on a traditional liberal rights discourse would cede too much political ground and, as Golder summarises, leave “unquestioned (indeed, it reinforces) the powers of law, state, and medicine to regulate…the character and quality of that life itself” (Golder 2015, 132). On the other hand, Foucault recognised the danger of tactical deployment of rights as a means of merely reforming or refining the object of critique. For instance, rights-based arguments against the death penalty may serve to simply fine-tune methods of execution to account for humanistic concerns. Rights: strategic or tactical reformulation of power relations? While the ambivalence of rights cannot be avoided, attention to the relationship between tactical and strategic deployment is an important precaution. Following military theory, a strategy is the general plan, while tactics are transitional decisions or acts contingent on the circumstances and overarching strategy – or in different terms, tactics are to strategy what apparatus is to dispositif. Golder, like Foucault, is concerned that the use of rights as a tactical counter-conduct will eventually be co-opted by the overarching strategy (i.e. the juridical order). And, while useful for a time, the tactical deployment remains within the strategy and may serve to further refine and reinforce its effects. Rather than remaining at the tactical level, points of vulnerability and weakness need to be exposed in order to shift and subvert the strategy itself. Golder cites the controversial French criminal defense lawyer, Jacques Vergès (with whom Foucault had some dealings), as an example of the way his strategy of rupture “contest the law’s legitimacy and its self-presentation so as to effect a rupture in the system itself”(Golder 2015, 125). Verges would uses the French courts as performative space to expose the French State’s criminal past (e.g. colonial violence and occupation in Algeria) and hence inability to sit in judgement on other criminal matters (e.g. Klaus Barbie, the Nazi war criminal). In a similar way, Golder argues that Foucault’s use of rights is not merely tactical and local, but “connected to a broader and concerted strategic engagement” that skews the liberal game of state versus individual and “to inaugurate a different game, with a different mode of relation to life” that can contest the dispositif or strategic network of power. It would seem that at this point, the significance of genealogical critique returns. That is, to be able to strategically rupture and destabilise our present and our understanding of ourselves. Golder’s argument for a Foucauldian politics of rights is provocative and productive. There are areas that I would have liked to seen explored further – especially a reading of this Foucault-as-rights-theorists in relation with other similar theorists more aligned with rights discourses, e.g. Arendt and Agamben. It would have also been useful had Golder discussed a contemporary example of rights-based politics where this Foucauldian approach could be adopted e.g. first or stateless peoples. Golder contends that a Foucauldian account of rights “actually facilitates a range of different political possibilities beyond, and potentially critical and transformative of, liberalism itself” (Golder 2015, 62). This is perhaps the real test of Golder’s book – does this account of rights provide something that is more useful that than juridical, universal and anthropological right discourses? Foucault, M. (1973) The Order of Things, Translated by. New York: Vintage. Foucault, M. 2000. “What is Enlightenment?” In Ethics: Subjectivity and Truth, edited by Paul Rabinow. London: Penguin. Foucault, M. (2014) Wrong-Doing, Truth-Telling: The Function of Avowal in Justice, Translated by Stephen W. Sawyer. Edited by Fabienne Brion and Bernard E. Harcourt. Chicago: University of Chicago Press. Golder, B. (2015) Foucault and the Politics of Rights, Translated by. Stanford: Stanford University Press. Despite the rallies and Channel 7’s broadcast of an “in-depth” interview with the founders of Reclaim Australia, the disintegration of the far-right populist movement appears imminent. Unlike their American cousins, The Tea Party, they do not have significant financial backing and the poor showing of “patriots” at the Parramatta rally last month suggests that this grass-roots movement lacks organisation and/or a critical mass of people willing to get out on the streets to call for “non-patriots” to get out of the country. However, the devolution of this movement is not a victory of Australian multi-culturalism or common-sense. Reclaim Australia gets small numbers to their rallies because they are unnecessary. Why spend a Sunday afternoon shouting in the streets when the political and economic system is silently re-asserting the normal order of things? The normal order of things is maintained through symbolic and systemic modes of violence. Unlike physical violence directed at specific subjects, the symbolic and systemic violence operates in the background. For example, the violence inherent in the production cheap consumer goods that benefit the lives of some while exposing factory workers to physical harm when making our flat-screen TVs in Mexcio or iPhone’s in China. Most of us do not see this violence because it isn’t directed at us. We only see the subjective violence of shootings or physical aggression. The subjective form of violence overshadows the systemic and symbolic forms of violence that allow the normal order of things to continue smoothly (for some). This is the violence inherent in fierce border protection policies or laws that target racial and religious minorities. It is the violence embodied in language that strips subjects of their humanness (e.g. illegal maritime arrivals) and makes the violence that they suffer either excusable or somehow deserving. Syst emic and symbolic violence tends to be invisible to those who benefit from the normal order of things that those modes of violence sustain. 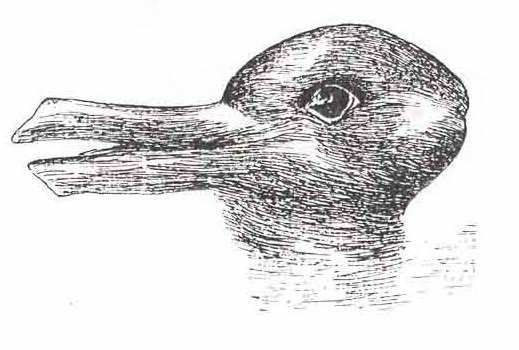 It is like a trompe l’oeil or the duck-rabbit illusion. For those who benefit these policies and arrangements look like caring necessity – “we need to protect ourselves” or “It is prudent to monitor Muslim boys because they are prone to radicalization”. However, to those on the other side, these policies and arrangements are experienced as exclusion and brutality. In this context, Reclaim Australia will wither away, not because there is insufficient support for their message, but because Australia is already well and truly claimed. This claim is sustained by the long history of violent colonisation and occupation, the effects of which persist today. However, it is a claim that needs to be continually reasserted on the bodies and lives of non-white migrants. In her recent book The White Possessive, Aileen Moreton-Robinson describes this “claim” as a white possession. White Australia’s existence as sovereign possessor is derived from the dispossession of Indigenous lands. As Moreton-Robinson notes, there is a deep anxiety that ‘racial others’ will in turn dispossess white Australia. The main utility of Reclaim Australia is as a warning that the normal order of things is being challenged. It is like a “flare-up” of the appendix in the body of white Australia, or to use another metaphor, a canary in a mine. Reclaim Australia is an expression of the anxiety that white Australia’s sovereignty is challenged. In the case of Islam, the fear of dispossession is also unfounded. According to the 2011 census, 2.2 % of the Australian population indicated they were affiliated with Islam. Of course the debates over Australia, radicalization, extremism, Islam, citizenship, borders and all the other nodes connected to this assemblage are not about evidence or facts. But control over who is admitted into white Australia, and the form that admittance takes. Some are wholly absorbed, while others remain in permanent parenthesis (asylum seekers). While those attending Reclaim Australia rallies (and those sympathetic to their narrative) may feel that Islam is an existential threat to the white claim to Australia, the terms and conditions of political and social reality are established by and for a white Australia. The challenge is not to reclaim Australia, but to place the current claim in the context of historical and contemporary forms of violence that privilege those who possess whiteness and its associated symbols and markers. In the words of Stan Grant, we need to challenge that violence and our own attachment and benefit from it. Australians who so laudably challenge the bigots among them need also challenge themselves. What are they prepared to give up? Land, history, flag, anthem, myth or identity – all of it is on the table if we are truly serious. Other countries fight wars over these things: we can do it in peace.